IDF holds successful test of the Barak 8 surface-to-air missile which will help secure Naval vessels. The IDF on Thursday successfully tested Barak 8, an advanced surface-to-air missile nicknamed “the Iron Dome for ships” that analysts believe could play a key role in securing the country's offshore gas fields. According to The Associated Press (AP), a military official said the system was tested from a ship for the first time and intercepted a small drone simulating an enemy craft. He said Barak 8 extends the range of Israel's aerial defense and that the system, being developed with India, should be operational in about two years. The official added Barak 8 can deal with strategic threats like Russian-made Yakhont missiles, which can be fired from land and destroy ships at sea. Officials believe Hezbollah terrorists in Lebanon possess Yakhonts. 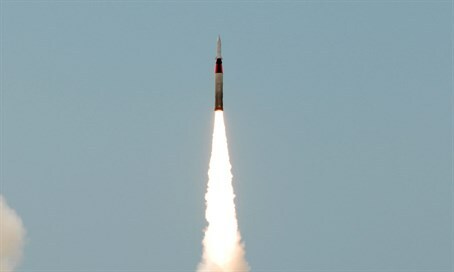 Defense Minister Moshe Ya’alon, commenting on the successful test, said on Thursday night, "The successful test of the Barak 8 system is further evidence of the outstanding quality of Israel's defense industries, and their ability to plan and develop weapons that constitute another layer in the defensive shield of the State of Israel." "Behind all this development and testing are men and women who invest their talent, ability and energy in order to conquer peaks of excellence every time," Ya’alon continued. "They are not known to the general public, but what they do is another symbol of the strength and gaps in quality between us and our enemies, as well as the innovation and creativity that help strengthen the Israeli economy." "The Barak 8 system will significantly improve the defense capabilities of the Navy in the face of threats and attempted attacks against IDF vessels and Israel’s offshore installations. The system is part of a series of advanced weapons and more will be developed, and they provide the IDF with an advanced and sophisticated defensive shell in the battlefields in the air, sea and land," concluded Ya’alon.